If you've decided to rent an apartment in New York City, you are already (hopefully) prepared to spend a ridiculous amount of money upfront. Monthly rent aside, landlords will typically demand first and last month's rent, a security deposit, and an array of other fun fees. One of those fees -- usually the big one -- is the broker's fee. A broker's fee is the commission real estate agents earn when they help you find a place to live, and it can be anywhere from one month's rent to 15% of the annual rent. Paying a broker's fee is pretty standard. In fact, finding no-fee apartments can be something of an Easter egg hunt in New York City. But they do exist. There are two kinds of no-fee apartments in the city: those that are rented directly through the landlord or management company without the involvement of a realtor, and those that have broker fees paid by the landlord (so there is a fee, technically, but the landlord has agreed to pay the broker his or her commission). Finding a no-fee apartment often requires more legwork (or more than a few concessions). But for renters with a particularly tight budget, it can be a way to save a couple thousand dollars on your New York apartment. Here's what you need to know. Turning to your social network is a great way to find an apartment without using a real estate agent. Let your Facebook friends, Instagram followers, and Twitter-verse know you're hunting for a new place, and you may be able to go straight to a landlord without much effort. Most online real estate-listing sites, including StreetEasy and CityRealty, offer a no-fee apartment filter. But there are some sites that actually specialize in no-fee apartments. NYBits.com, for example, primarily lists no-fee units across New York City (according to Brick Underground, about 75% of the rentals on NYBits don't require a broker's fee). The highlight of this site, though, is the directory of buildings and property managers. Oftentimes, the hardest part is figuring out who the hell to contact when you finally discover a no-fee apartment you'd like to see. NYBits tells you where to look (apartment buildings, co-ops, and condominiums) and who specifically to contact to avoid involving a brokerage firm or agent. On the relatively new site UrbanEdge.apartments, only property owners can create listings. Every available unit is vetted by site managers to make certain brokers aren't adding posts, ensuring every single UrbanEdge apartment is no-fee. If you manage to find a unit you love through a property management company, great. But if not, you're probably sifting through listings that landlords are having a hard time renting. This is the second type of no-fee apartment we discussed. 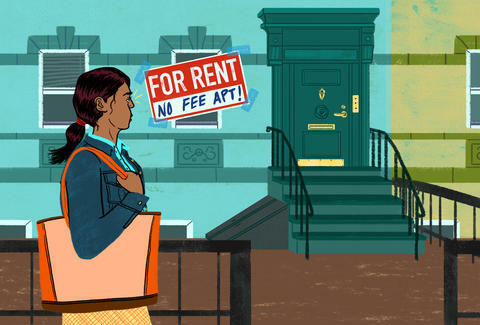 If a landlord can't find someone to rent an apartment -- especially in an incredibly competitive market like New York City -- this is often a neon-lit warning sign. Don't be surprised if you see a no-fee apartment and there's something clearly undesirable about the location or the unit itself. But that doesn't mean landlords don't have better reasons for needing help renting an apartment. If it's a brand-new building and he or she is trying to place a number of tenants in a short period of time, or if it's the off-season (in New York City, that's winter), you may find a landlord willing to shoulder the broker's fee. Just because you've found a no-fee apartment doesn't mean you're actually going to save any money. Calculate the cost of your annual rent and see how it compares to a more affordable place with a fee. Sometimes landlords fold the fee into the monthly rent, making it look like a good deal when, really, it's not. If the rent is slightly higher than comparable apartments in the neighborhood, but it's being offered without a fee, that's your cue. Unfortunately, apartments advertised as no-fee are often scams. A unit may be listed as no-fee to lure eager and optimistic renters, and only upon arrival (or worse, after falling in love with the place) could you be told there was an error or a misunderstanding. It was only an "innocent mistake," for example, that it was highlighted as a no-fee rental, or the landlord changed his or her mind about offsetting the fee. The apartment you love, or wanted to see, does in fact have a fee. And unless you're willing to turn your back on the unit, you'll have to pay it. Melanie Taryn Lieberman once inherited an apartment through a friend and didn’t have to pay a broker fee. But that was just once. And it was also in Boston.